I make it a point to try to do at least one kind thing for a stranger each day. Whether it’s something simple like holding a door open for a mom toting small children or more formidable, like giving a heftier than usual donation to a charity—I do it out of generosity and to remind myself that seemingly easy acts of kindness can go a long way in helping to make the world a better place. I’m no Pollyanna. I don’t expect anything in return but I also have to be open to the possibility that my efforts might not be wanted or even appreciated by others. On a recent trip to Boston, at his request, a friend and I helped an elderly blind man make his way through the train station. We got turned around a bit and ended up heading in the wrong direction. A simple mistake but it set off something fierce and angry in him, so much so that he spewed out truly hateful comments to us. Sensing an imminent danger, we got him to a safe spot, pointed him in the direction he had intended to go, and left hoping for the best. We’re all vulnerable in certain ways. We each bring a history to any situation that others may not be aware of. Clearly something deeper than meets the eye was going on for this man to get so angry over a simple turn in the wrong direction. It was something I couldn’t see but felt so deeply that I thought my friend and I were going to be physically hurt. I keep this incident in mind when I think about immigrants all over the world. We never know what people bring to new places and situations. I’m of the mind that most people move around the world for something we all want at certain points in our lives—something better for our families and for ourselves. It’s a feeling that transcends nationality and culture. My own grandparents were immigrants from Europe, my husband’s from Canada. I’m certain they faced fear and unkindness along the way, but they didn’t give in to those fears and were able to build better lives. This man at the train station may have had his own fears that he thrust onto me, but I choose to view the encounter as an aberration. I’m optimistic about others and open to human kindness even if at times it sets off something unexpected. The reason for this trip to Boston was to visit a friend who is in the process of establishing a new home there. She welcomed me with a lunch of Shakshuka. 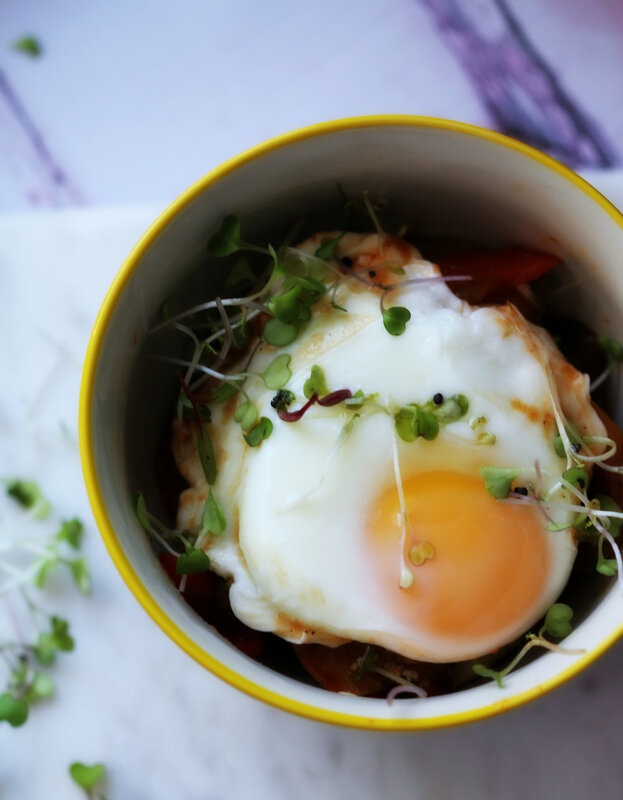 The dish consists primarily of bell peppers and tomatoes that are simmered together and topped with a cooked egg just before serving. The dish was new to me, and when I tried to learn its origins I found out that there are as many versions of where it began as there are recipes to make it. It seems there’s some consensus that the dish started in North Africa but made its way to the middle east where it’s hugely popular. It can be called by other names―Menemen is one. Mexican Huevos Rancheros is similar and many popular cookbook authors such as Diana Henry and Yotam Ottolenghi have published their versions of the dish. The key ingredients are eggs, peppers, and tomatoes. What I love about this dish beyond its flavor is its blending of culture with nourishment. My version is certainly inspired by that lunch and by the authors I listed above. I chose to make it quite spicy by including a large amount of garlic and hot peppers and simmered it in the oven on relatively high heat to reduce any liquids from the vegetable in order to concentrate their flavors. Like many others, I topped it with yogurt and feta cheese and served it with flatbread. It’s an amazing meal. Try it. Make it your own, too. Place a medium-sized dutch oven or lidded pan on the stovetop. Heat the olive oil in the pan. Add the onions and garlic. Sauté until the onions are translucent, about 5 minutes. Add the bell and jalapeño peppers, toss with the onions and garlic, and sauté until very tender, about 10 minutes. Add the crushed tomatoes, stir everything together, bring the liquid close to a boil and cover the pan. Place in the oven for 45 minutes. Remove the pan from the oven. Crack the eggs and pour carefully on top of the vegetable mixture. Cover the pan and place it back in the oven. Bake until the eggs are set but yolks still runny, about 5 minutes. Remove the pan from the oven again. Drizzle the yogurt over the cooked dish. Add the crumbled feta, salt and freshly ground black pepper. Top with micro-greens or fresh herbs. Serve hot in deep bowls with flat bread or a baguette. This recipe was inspired by many versions including those published by Yotam Ottolenghi, Diana Henry, and in the New York times. And, of course, made by my dear friend, J. If you prefer a less spicy dish, leave out some or all of the jalapeño peppers. Consider serving the Shakshuka with Iranian Flatbread or Savory Cheese Turnovers.